L 30-40″(76-102 cm) W 80-88″(203-224 cm). Rarely heard. Soft mews and high squeals. Description: Sexes similar but female larger. Dark brown. Common name comes from golden feathers on nape (only visible at close range). Legs feathered to talons. 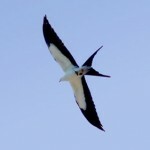 Immatures show in flight white patches at base of primaries and white tail with dark band at tip. Habitat: Found in arid, open country with grassland for foraging. 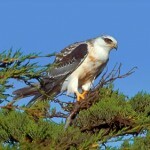 Usually found near buttes or canyons which serve as nesting sites. Winters near rivers or reservoirs. Where in Nebraska: Uncommon migrant and winter resident across the state. More common in west. 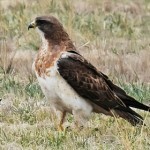 Often a permanent resident and breeder in west, including the Pine Ridge area of Nebraska. 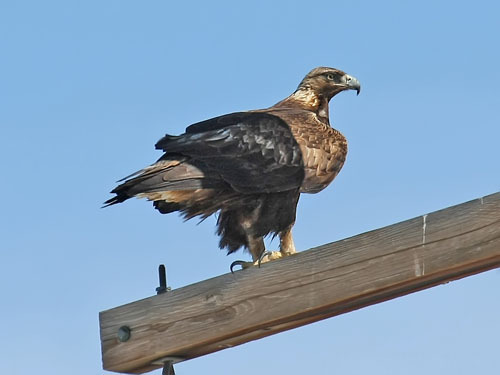 Fun Facts: Golden Eagles are the largest Eagle in Nebraska and capable of killing large prey such as cranes, domestic livestock, and wild ungulates.